If you want action, Arlington is the place to be! Between the Rangers, the Cowboys, and Six Flags, you could spend every weekend experiencing dizzying highs (we won't talk about the lows). With so much fun to be had, why would you want to spend even a second of your free time pushing a lawn mower or hauling a rake? Lawn Love is here to save your weekend! We've taken today's online technology, some old-fashioned quality and customer service, and have mixed them together to result in a lawn care service that's easy, convenient, and that will leave you with a lawn that is the perfect plush, green setting for your own family's fun and games. So why wait another minute? 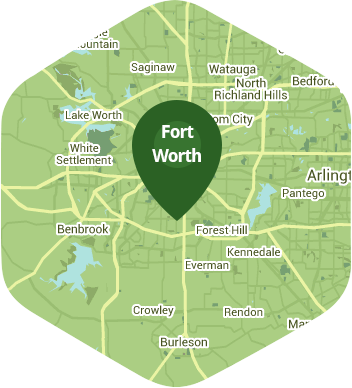 Contact Lawn Love today at 817-345-6362 or take advantage of our easy two-minute quote, and see how we can get you the perfect lawn, in a perfectly easy way. Jacob was a stellar pro. Super nice guy, and really takes pride in his work! Will definitely be reaching out to him again for any lawnwork I need a hand with. Rated 4.73 / 5 stars in 4,082 Arlington customer reviews. It looks like the expected precipitation in Arlington is 0.02 inches, which means you will probably have to water your lawn today. Dusk and dawn are the best times to water your lawn (the sun will rise at 6:56 AM and set at 7:59 PM today in Arlington).